Key to how we work is helping in a sustainable way and thus break the often familiar cycle of homelessness. Through our dedicated team of staff, trustees and volunteers we operate two hostels, The Haven in Stevenage and The Sanctuary in Hitchin, and manage 11 move-on properties, transforming the lives of around 150 people every year. Join us for an evening of music and fun all in aid of Stevenage Haven! 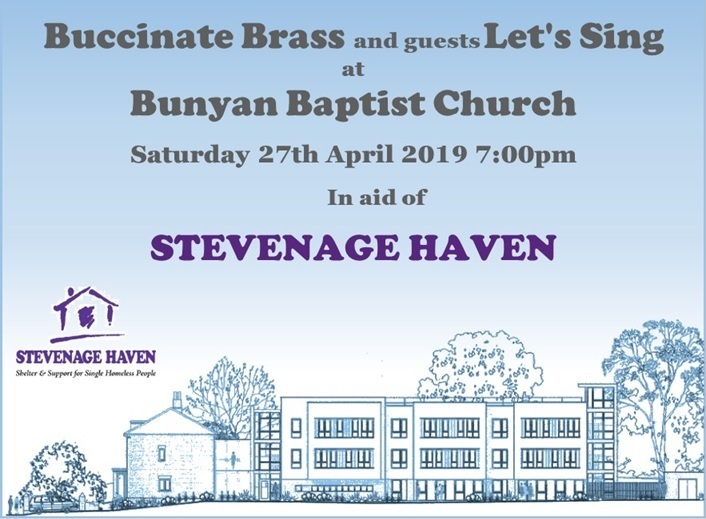 We are delighted to be supported by Buccinate Brass and Let's Sing on 27th April at the Bunyan Baptist Church in Stevenage. Tickets are only £5! Email us to reserve your tickets - this was a sell out last year so book now to avoid disappointment!